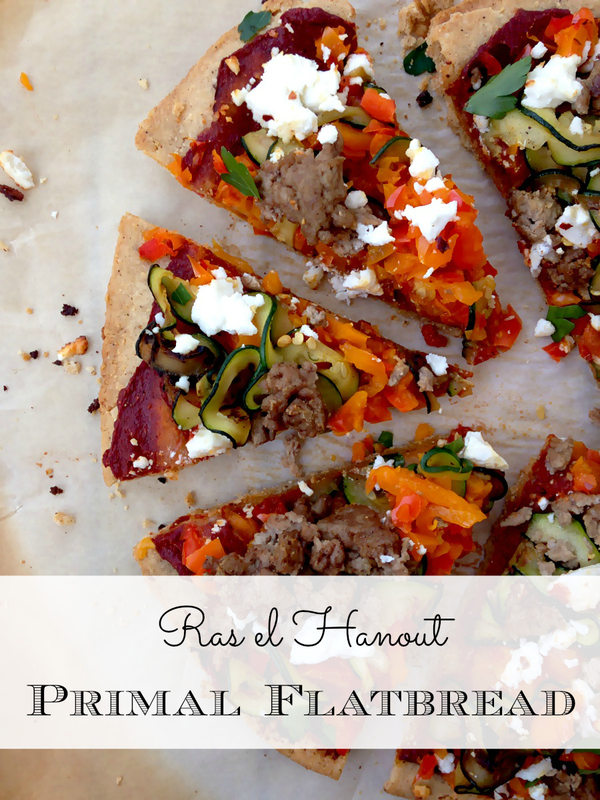 This Primal flatbread is a riff on my Ras el Hanout Pizza recipe… pretty much the same flavors, but different execution. I love to mound toppings up like you wouldn’t believe, so this stiff Primal flatbread crust is the perfect enabler. It’s made with tapioca flour, so I wouldn’t exactly call it low-carb. But it’s delicious, and won’t result in the same nasty symptoms as if you’d eaten a conventional wheat crust. After throwing together the crust, you load it up with your favorite things. In this case I chose plenty of spiralized zucchini, lamb (my desert island meat), sticky fresh feta and sweet bell peppers. The flavor of the ras el hanout blend lends exotic flavor notes to round out the combination. I love it! 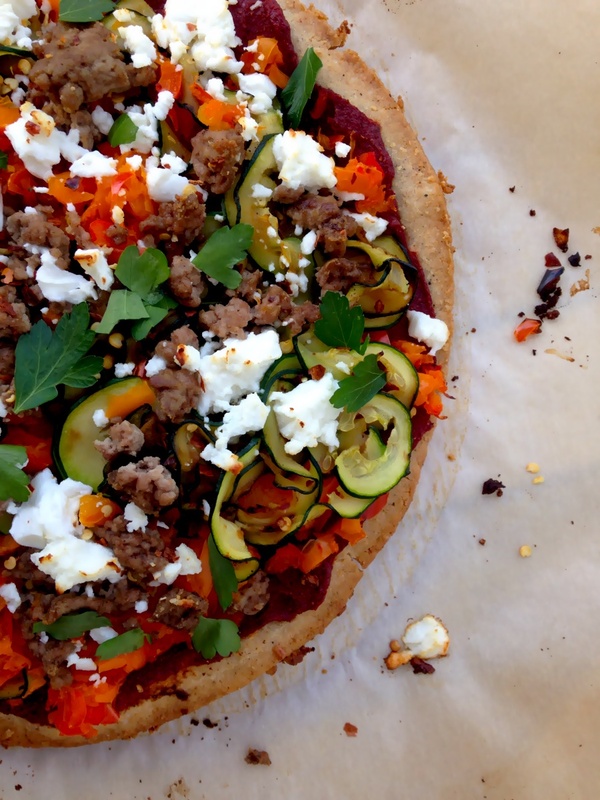 A sturdy flatbread crust holds veggies, lamb, spices and feta piled high. To make the crust, stir together the tapioca flour, coconut flour, salt and ras el hanout. Mix in the olive oil and warm water until sticky crumbles form. Using your hands, squeeze together the dough, and transfer to a parchment-lined pizza stone. Lay a length of plastic wrap over the ball of dough, then roll it out into a circular disk, about ¼ inch thick. Bake the crust in the pre-heated oven for 10 minutes. If the crust swells with air pockets, prick them with a knife once you remove the crust from the oven and force the crust flat. To make the toppings, cook the ground lamb in a small skillet over medium for approximately 5 minutes or until mostly browned. Transfer to a bowl and let cool to the touch. Shred the bell peppers in a food processor until roughly chopped, then transfer to a skillet over high heat. Cook, stirring occasionally, until the peppers' water has been released and has cooked off. Transfer to a bowl and let cool to the touch. Using a spiralizer, cut the zucchini into ribbons (or cut into thin rounds if you prefer). Transfer to a skillet and cook over high heat, stirring occasionally, until the zucchini's water has been released and has cooked off. To make the sauce, combine the tomato paste, ras el hanout and water. To assemble the pizza, smear the sauce over the crust after 10 minutes pre-baking in the oven. 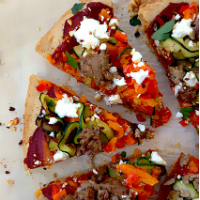 Top with the bell peppers, lamb, zucchini and crumbles of fresh feta. Return to the oven, and cook for an additional 10 minutes. Remove, let cool until warm then top with a sprinkle of parsley and red pepper flakes. Slice and serve. Hertha, I received my ras el hanout already blended as a gift, but google “ras el hanout recipe”…that looks promising.